Hotel "No. of Room/s" Column with increased upto 255. "-" Vehicle type added in transport voucher. "Account Voucher" All grid view revised for amount. "Want Currency Based" Options added in Statement=>Account. "Sales register (VAT)" New report added in User Design=>Custome. "Billing Discrepancy (BSP)" Working revised. "Don't include credit days" Option added in Ageing Anlysis. "PAN No." Added in Visa Booking & Visa Register. "Passport & PAN Detail" Added in FIT Voucher Register. "Rename Driver" Tag Added in App.conf file. "Rent A Cab" Voucher email subject revised. "Currency" Problem in ledger if currency not selected in branch master solved. "Credit Days" Column added account register. "Lead FollowUp Reminder" Working revised. "CRS PNR" Added in narration. "Statement" New module added in utility. "Billing Discrepancy (BSP)" Working revised for india. "Print Gov't Tax (Zero)" Report Revised. "Auto e-mail (Bulk mailing)?" Options added account master. "Web Integration" Working revised for Un-Billed Customer, Supplier. "TAC Rounded Method" Based on account master for . "Mobile No." Added in outstanding report. "Invoice No., Date" Adeed in Hotel, Transport, Excursion, Visa Booking Voucher Register. "Detail lable text" Changed for Hotel, Transport, Excursion, Package Sales & Return. "Amount" Column added in CRM Quotation, Booking. "Fixed SkinName" Options added in .config file. "strUserAuxiliaryRights" Error in login solved. "strAccountAgencyCode" Column width increased to max. "Web Integration" Working revised for error column 'decPurchaseBasicAmt' not found. "Billing Discrepancy (BSP)" Working revised for africa. "Amount in word" Working revised for french. "Billing Discrepancy (GSTR 2A)" Working revised. "Web Integration" Working revised for discount & Commission. "Franch" Amount in Word working revised. "View only this user record." options added in used master (Rights for Auxiliary). Pull "K3" amount from Abacus IUR file. "Web Integration" Working revised for place of supply & account master. "Half Page" Voucher Printing revised. "Billing Discrepancy (BSP)" Revised payment mode new column added. "Tour (Hotel, Vehicel, Excursion)" New report added in UDF=>Tour. "Tour" Sales & Return printing revised. "Portuguese" Amount in Word working revised. "Portuguese" Amount in Word added in Branch Master. "Due Reference" Options Added in outstanding & payment request report. "Caption" New Master added in Master=>Setup=>Caption. "Print Jurisdiction" New options added in Master=>Setup=>Options (Printing). "Ctrl+V (Paste)" for visa booking detail entry. "Ticket Print" revised for passenger name. "Tariff Name" Working revised for local tariff. Duplicate "Ticket No." Validation removed for railway, bus invoice & credit note. "Tour detail" Added in account receipt print. "Booking Reference" Added in account voucher view. "Want With Account Detail (Address|Statutory)?" New options added in Account ledger. "Account Statement" Report revised for speed issue. "Index" added in ledger table. "Night Halt from " New field added in vehicle Tariff. "Night Halt Based On Actual Night/s?" New field added in vehicle Tariff. "Dashboard" Loading stucked problem solved. "Tariff Name" Working revised for outstation tariff. "Passenger Name" Printing problem in invoice, credit note (if multipal pages) solved. "Type" New column added in All Column Report Sales, Return. "Gross Profit Summary, Detail" Report Revised. Order by "Voucher Number" in all voucher printing. "Total Gov't Tax" Column added in UDF=>GST Return=>Register. "Don't Show Dashboard on Startup?" Options Added in Master=>Setup=>Options. "Don't Show LeadFollowUp Alert?" Options Added in Master=>Setup=>Options. "Don't Show General Reminder Alert?" Options Added in Master=Setup=>Options. "Fare Basis, Class" Column added in UDF=>Purchase Vs Purchase Return (Detail). "Voucher Reference grid" Working revised for filter. "Web Integration" Working revised for account balance. Tab Stop in "Rent A Cab Voucher" reporting & releasing. Error in "Payment Request" solved. "Outstanding Summary" New report added in UDF=>Account. "Markup" Column added in Excel Import Setting. "Want Based on Travel Date?" Options added in Outstanding Statement report. "Travel Date" Column added in sales return. "Deactive?" Options added in company, branch master. "SET NOCOUNT" Checked in stored procedure & code. "Backup (Google Drive)" Wrong status problem solved. "Total Day/s" Column added in Rent A Cab Vendor report. "ITC Eligibility %" Column revised in UDF=>GST Return=>GSTR: Register. "string.Compare" Added for string compare. "SMS, WhatsApp" Working revised for Vendor. "Billing Discrepancy (GSRT 2A)" Working revised. "Voucher Tracking" Working revised for Cleared purchase & return. "GSTR 2A : Reconciliation Statement" New report added in UDF=>GST Return. "Billing Discrepancy (BSP)" BDR Based On enabled. (On Purchase Date) added. "Branch" Added in bank reconciliation. "October" Spelling mistake correction done. "Billing Discrepancy (GSRT 2A)" Working revised filling period column added in Purchase, Return. "Outstanding Statement" Report revised for narration working. "UQC" In upper for GST return. "Billing Discrepancy (GSRT 2A)" Added in Report=>Goods & Service Tax=>Billing Discrepancy (GSRT 2A). "Vendor Purchase" In invoice problem solved. "BSP BDR file format" Options Added in Master=Setup=>Options. "Ageing Analysis Bill Wise" Report revised. "Amount In Word" New options adeed in branch master (Print amount in Word format). "Record Zooming" Added in UDF all column sales, purchase report. "Amount Mismatch" Error checking added in Utility=>Error=>Entry. "Voucher Date > Reconciliation Date" Error checking added in Utility=>Error=>Entry. "tblAccountReference" New sheet added in import. "Processing" New column added in Sales, Return grid. "Sales=> Processing, Other, Discount I & II" New column added in Excel Import Setting. "Group Name" New column added in Excel Import Setting. "Trading" New column added in All Column Report Sales, Purchase, Return. "Company List" Tag Added in .Config for Display Nick Name in Company help. "Branch Delete" Function revised for delete branch. "Books Summary Detail" New report added in UDF=>Account. "Account Setup" New report added in UDF=>Account. "Data Merge" Revised for Account. "Account Used In" New feature adde for delete account. Don't copy "Sales & Return Prefix" while create duplicate entry. "Migrate Data" Working revised for account reference. "Object Master" Auto update while update. "TDS Receivable, Payable" All report revised. "Account (Books Monthly Summary)" New report added in UDF=>Account. "Account Alert" Account name (Problem Solved). "Dependent Assembly" Checking added for Google Drive. "Migrate Data" Working revised for Service Tax on (II). "Backup Restore" Working revised for logical name. "Error in Carry Forward Previous Year Data" Module (Solved for). "WhatsApp" Working for send pdf file done. "Rent A Cab (Processing, Other)" Lable changed in invoice printing. "Hrs." Printing revised in rent a cab invoice printing. "Required Fields" Options Added for Rent A Cab Reservation, Duty Slip, Close Duty (Reporting, Releasing Date). "Reporting, Releasing Date & Km(s)" New Field Added in Rent A Cab Reservation, Duty Slip, Close Duty. "Don't allow to delete detail entry. (If don't have delete permission)." Options added in user master (Rights for Auxiliary). "Report e-mail Subject & Attachment file name" Working revised. "Required Fields & Print" Options added in Master=>Setup=>Options. "Entry Log" Revised for voucher. "Split Company Data" Working Revised. "TDS Register, Summary" Revised for unadjusted entry. "Cheque printing" Revised for amount print. "Currency working" Revised for forex gain/loss field added in account master. "Hrs., Kms." Printing revised in rent a cab invoice printing. Currency base Ledger report working revised. Auto pick Sales Reference in Return. "Account Balance Alert" Added in Options Account Info Alert. "Mobile, e-mail, Resign Date" Column added in employee view. "KYC Date" Column added in Account, Contact, Employee. "Reminder for status" Column added in tour booking checklist. "Voucher Tracking" Working revised for purchase return. "WhatsApp" Working for text message. Branch Wise "Voucher Prefix" Options added. "Migrate Data" Working revised for (Input string was not in a correct format.). "Service" Added in CRM Quotation & Booking Print. "Detail Grid" Focus working revised. "Incentive" Column added in Excel Import. "Reference" Column added in CRM. "Employee, Vendor" Column added in UDF=>Sales=>Detail Register (Rent A Cab). Send "Birthday, Anniversary, Passport, License, Badge" sms added in dashboard. "Destination" Column added in Costumized Tour (Check List), Costomized Tour (Checkin). "CC, BCC" Added in Send email. Those users which are not active should not be displayed. "Multipal record" problem in tour if multipal service selected solved. Used design favorite not working solved. "Branch" Added in BSP, Supplier Billing Discrepancy. Purchase, Sales, Return, Narration Working Revised. "Against" Problem in Purchase, Return, Voucher Solved. Import "Employee Detail" from excel. Error in "Service Charge Invoice" solved. "MIR" Exchange ticket for CRS integration working done. "Tax Pay Later" Added in Purchase, Return. "GST Return" Working Revised for Purchase, Return ITC. "MIR" Travel date problem solved. "0.01" for FOC, "0.02" for Not Applicable added in Extra Adult, WB, NB. "0 Night" Problem in tour solved. "General Credit, Debit note" Added for tour booking voucher help. Tour booking help added in account voucher. "Voucher in booking, Booking in voucher" Added in Master=>Setup=>Options. Reissue code added for MIR. Default nature of supply working done in sales, purchase, return. "Entry Log" Added in Excel, CRS Integration. "Hide Column" Options in report revised for Favorite. "Rent A Cab" Booked by added ledger. "Travel Date" Column added in sales. "Sales => Travel On Register" Report Added in UDF. "Excel Integration, CRS Integration" Added in utility menu. "Financial Year" Data locking added in data locking module. "Sales Point PCC ID" Added in Sales, Return. "Sales Point" Master added in Master=>Ticket. "Extra Amount, Ticket & Other Amount" Column added in tour booking. "Sign on" ID added in employee master. GST Report revised for excess advance received & paid adjustment. "PCC ID" added in options. "TDS eReturn Register" Report added in UDF=>Account. Trial Balance & Balance Sheet Revised for P & L.
Adult, Extra Adult enabled in tour for hotel. New column added in tour booking traveller detail. Duplicate blank "e-mail" message box problem solved. "Schedule Code, No. of Room/s" Added in Tour Schedule. "Value Added Tax" Register & summary added. "Basic Fare" Problem solved in crs integration. "Voucher Heading" Added in object master. "Purchase Return" Base amount auto pickup from return solved. "E - Ticket, Rent A Cab Performa" Wrong e-mail subject revised. "GSTIN/UIN No." Added in Purchase, Return & Voucher (if supplier have multipal no). "Rounded Off" function revised for minus amount. "Financial Year" Date locking removed. "Books beginning from" Date added in company master. "GSTR 1, GSTR 3B" Report revised. "HSN | SAC Code (II)" added in service master. "Second GST" added in sales & return. "EMD" Type sales & return added. "Journal Voucher" grid loading view revised for loading problem. Duplicate "contact number, e-mail" message box added in contact master. "CRS Integration" Module working done. "Directory.GetCurrentDirectory()" function replaced with "Application.StartupPath". Sales return value added in "GSTR 1 : Summary For HSN". "GSTR 1 : Summary For HSN" Sales return value added. "Data Locking" Option added in object master. "Submission Stage" Master added in Mastr=>Auxiliary. "Start from, End to" Column added in dashboard reminder. "Tour Schedule ID" added in user tour schedule help. "Meal Plan" added in hotel voucher printing. "Using Default Path for Send Mail?" Options added in Master=>Setup=>Options. "Re-Numbering Voucher Number" module working revised. "Login Log" New module added in utility=>log. "Print Customer ID ?" Options added in Cab Voucher. "Don't allow to view if no edit permission" Options added in user master => rights for auxiliary. "CRS Integration" New module working started. "Advance, Balance" Column added in UDF=>Tour=>Tour (Checkin Register). "Advance" Column added in Tour Booking Check List. "Deactive?, Black Listed?" Working revised for edit mode. "Card Purchase, TC Stock" New module added for Forex. "Sector Detail (Ticketing)" Report added in UDF=>Sales. "GSTR 3B" (d) Inward supplies (liable to reverse charge) revided. "GST Return" Excel & UDF Report Revised (V1.5, V1.1). "Tax No. Caption" Options added in Master=>Setup=>Options. "Register (Railway Ticket)" Report added in UDF=>Sales Vs Sales Return. "Against" column added in voucher reference help. "Purpose" master added for forex working. "BTQ (RBI+)" field added in RBI rate master. "Approval" column added in views. "Gov't Tax Amount" problem solved voucher charges detail. "Edit, Delete" Validation done for approval control. Walking Name Added in Visa Booking. "intObjectID" problem solved in Excel Integration. "[Pre GST]" Column problem in GSTR cdnur solved. "Group Entry" enabled in miscellaneous service. "Report Export Name, Subject" changed. "Tax Caption" added in service master. "Discount (A), Discount (B)" Column added in all Column report. "Employee Wise Income Vs Expense" Report revised. "CommandTimeout increased 10 minute" for dbMaintenance, dbCHECKDB, PerformBackUp. "(TRN)" added in Hotel, Transport, Excursion, Cab Voucher, Cab Performa, Fuel Voucher, Visa Booking. "Reference No." added in UDF Report=>Detail Register (Rent A Cab). "Attachment Location" Added in config file. New Object not display in permission master while edit (solved). "Allow to locked date entry, Allow to future date entry" New options added in User Master (Rights for Auxiliary). Working revised for "Cloud Server Login". Error Create Company, Error in Login Windows. "Column Auto Width" New options added in (Master=>Setup=>Options). "Grid View" Loading working revised. "The round function requires 2 to 3 arguments., Incorrect syntax near the keyword 'CASE'" Error solved in (Billing Discrepancy (BSP)). "CRM Booking, Tour Booking" Booking prefix enable & get last booking prefix. Get "Last Voucher" Prefix if prefix not found in master. "Re-Numbering Voucher Number" New module added in utility. "Fuel Difference" Working revised in cab voucher. "Connected User" Button added in main MDI. "Voucher (Single Print)" Account selection validation removed. "Show current financial year data, Show all financial year data" Options added in create duplicate voucher. "Other to Taxes & Other" label changed in miscellaneous invoice & credit note. "Register (Air Ticket)" report added in UDF=>Sales Vs Sales Return. "Register (Air Ticket)" report added in UDF=>Purchase Vs Purchase Return. "OC Tax" Pull from Amadeus (AIR), Galileo (MIR) file. "Cenvat %" Column added in purchase & return detail entry. "Under" Column added in Sales Vs Sales Return (All Column), Purchase Vs Purchase Return (All Column), Account (Gross Profit (Summary)). Balance column problem in "Trial Balance" solved. "Want previous year invoice for credit note?" Options added in Sales Return. "Object" Added in Outstanding Statement & Payment Request. "First in first out method, Bill Wise method" Options added in ageing analysis report. "Tour Quotation, Booking" Service RetRecord Selection Problem Solved. "Single Invoice" Multi credit note enabled. "View Date" Added in toolbar for quick entry. "Invalid Invoice Reference!" Validation removed for package credit note. "Reference (M), Analysis, Sub Agent" Column added in UDF=>sales Vs return all column report. "Extra Hrs. Rate" Printing changed in Rent A Cab invoice. "Follow-up Date" Column added in lead followUp view. "Copy Voucher" Based in financial year. "Date Filter & Account" Added in voucher print & copy voucher. "OC Tax" New field added in sales, purchase, return. Required "Nature of Supply" Added in group master. "Don't carry forward "Profit & Loss A/c" balance. "Place of Supply" Based on branch state. "Destination" Column Added in Lead Management. "Branch" Added in GST Return. "Carry Forward Pending References, Split Company Data" Working Revised. "Walking Name" Problem Solved for Reference Detail. "Approval Control" New Feature Working Started. "Performa" Added in Rent A Cab Reservation. "F2 ShortCut" for Set Focus in AutoFilter Row. "Void/Direct" Added FIT Voucher View. "Reference of" Added in Guest Help. "Account Book Summary" Report Revised. "Carry Forward Pending References" Working Revised. "Inclusive Tax" Working Revised for % Value Of. "Closing Balance <> 0" options added in account ledger report. "Nested Group" Added in all report group Help. "Reference of" Column Added in FIT Voucher UDF Report. "Create Financial Year/Carry Forward Previous Year Data" Working Done. "Account Register" Report Revised for Analysis Acoount, Handle By. "Profit & Loss" Report Revised for Gross Profit (+)/Loss(-) B/F & Group Total. "Applied from" Excursion Date Problem Solved in Tour Booking. "Ledger Update" Revised for Agent Loyalty. "Voucher" Added in Web Integration. "intNatureofSupplyID" Column Added in WebIntegration. "Duty Slip" New SMS Templates Added. "Customer" Added in Tour Booking UDF Report. "Guest" Added in Hotel, Transport, Excursion & Package Sales & Return View. "Want Ledger In Base Currency?" Feature Added in Account Ledger. "Room Detail" Added in Tour Booking. "Allow to Change Tour Booking Status" Feature Added in User Master. "Emergency Contact No." Added in Tour Booking Traveller List. "Data Backup" on Software Logoff. "Show Lead to Owner?" Feature Added in (Master=>Setup=>Options). All "Voucher" Grid View Revised. "SET ARITHABORT ON" Database Function Revised. "Check Is Purchase & Return Received" New Report Added in UDF=>Account. "Supplier Bill Number Length" Feature Added in (Master=>Setup=>Options). "Leader" & "Executive" Column Added in Tour Booking. "Show Margin in Tour Booking" Options Added in User Master. "Supplier, Purchase" Column Added in Tour (Checking Register). "Total Pax" Added in Lead FollowUp. "Footer Sum" Added in Tour Booking. "Alter/Edit" Locked if invoice created for Tour Booking (Only Account Have Right's for Edit). "Margin" Column Added in Tour Booking. "Data Migrate" revised for NumberToWords function. "YR" Problem in GDS Pulling Solved. Invoice Heading, Credit Note Heading Added for VAT. "HSN Summary" (Description) revised for GST Return. "Update Nature of Supply" Button Added in Account Master Statutory Information Tab. "Violation of foreign key constraint" In Tour Booking (Voucher Selection) Solved. "End Date" Added in Rent A Cab Sales Detail Register. "Violation of UNIQUE KEY constraint 'CK_tblLedger'" Error Solved. "VATTIN" Added in Voucher Printing. "Ledger : Analysis Account Wise" New Options in Ledger Report. "Summary of documents issued during the tax period" added in GSTR 1. Error solved in advance filter of Air Ticket Invoice. Error While GSTR Return Menu Click Solved. "Receiver Name" Added in GSTR 1 Return File. "Language" Added in Branch Master. "PNR Stock Register" New Report Added in UDF=>PNR Stock. "PNR Stock" Validation Added Sales & Return. Sales, Return & Balance Column Added in PNR Stock. "PNR Stock" Added in Sales & Return. "Address Info." Required Address Info in Account Option Added in Master=>Group. Advance Paid to Driver Column Added In Rent A Cab Voucher. Close Duty No. in Purchase Against Help. "Vendor Register" New Report Added in UDF=>Vendor. Date Problem Solved in Rent A Cab Reservation & Duty Chart & Reminder. "Executive Wise Day/Monthly Summary" New Report Added in UDF=>Tour. Value Added Tax Working Started. Compulsory Tour Cost/Destination Feature Added in (Master=>Setup=>Options). Alt+F5 for Account Master Edit/Alter. Account Handle By Alert Added in in Voucher. One Click Pass multipal discount JV (Reference Wise) new feature added. Total Hrs in Rent A Cab Invoice Issue Solved. Rights for change "Account Opening Balance" options added in user master. Characters limit increased to 16 for purchase & retrun bill no. Travel date issue Solved for "AIR file". "Account Label" printing added in Report=>Printing. "Is LTC Applicable?" Options Added in Tour Booking. "CRM Dashboard Rights" added in user master for CRM dashboard. PNR Stock New Module Added. Changes Done for Rent A Cab Module. "Account (Day Summary)" New Report Added (Report=>User Design). Purchase Number should be less than 16 digits. Popup of the Item Name/ HSN codes in Purchase, Return. "Interest Calculation" new report added. "Depreciation Calculation" new report added. MIR file working revised for customer discount. Working revised HSN Summary for "GSTR 2". Drill Down Added in "GSTR: Register". "Billing Discrepancy (BSP)" Revised for index outof Range. Working revised for "GSTR 2". Inwards Detail Added in "GSTR 3B". Working done for "GSTR 2". "Billing Discrepancy (BSP)" Required Foxit Reader. "Lock Duplicate Lead?" Options Added in (Master=>Setup=>Options). Working Started for "GSTR 2". Against In Purchase Return Grid View Solved. "Billing Discrepancy (BSP)" Process Revised for NR:2A. "Data Migrate" Process Revised for Railway. Show Column in (Account Help) Options Added in (Master=>Setup=>Options). Lead Date should not be change. (Only CRM Admin Allowed). Duplicate queries should not be added (Locking based on Mobile, email). "Want Only Reference?" Options Added in Outstanding, Payment Request Report. "Quick Filter (Ctrl+Q)" New Module Added Utility Menu. "Basic, YQ, YR, K3, Tax, Total" Options Added in Sales, Return Airticket Printing. "GSTR Register" Revised for Multi Item in Purchase, Return. "Monthly Total" Added In Rent A Cab Invoice. "Re-Numbering Journal Voucher" Added in Utility. "Print Options" Added In Account Master. "Print Options" Added in All Sales & Return. "Migrate GST Data" Working Revised. "Tax III, IV" Column Enabled for Misc. & Visa Service. "Want Report in Detail?" Option Added in Outstanding Summary Report. "Filter for Management?" Added in Gross Profit Summary Report. "Migrate GST Data" Working Started. "Auto Move" Date Control Working Revised. GSTIN, HSN/SAC Added in Purchase, Return Voucher Print. "Driver Allowance" New Report Added in UDF=>Duty Slip. Duty Detail Added in Rent A Cab Sales View. Get Vendor Amount Button Added in Purchase. Driver, Contact Column Added in Rent A Cab Voucher View. Pay Later Column Added In Account Statement Report. Set Starting KMS Based on Ending KMS in Rent A Cab. "Notes for Printing" Added in Account Master. "Nature of Supply" Revised for Export & Import. "B2B Deemed Export" Option Added in Nature of Supply. "GSTIN Activation Date" Added in Account Master. "Z" Validator Removed from GSTIN. HSN/SAC Code Added in Purchase & Return. Goods Purchase Return (Multi Item) Added Purchase Return. "Processing Charges (Pay Later)" Column Added In Sales, Purchase, Return Module. GSTR 1 Revised for CDNR. "Want % Value of?" Options Added (Master=>Setup=>Options=>Statutory Info). "This is a Computer generated" Tag Added in (Master=>Setup=>Options=>Printing). Narration Added In JV, Credit & Debit Note Register. Error in Narration Detail (F2) Solved. Check GSTIN Is Valid? Buttion Added in Account Master. GST Return Report & Excel Revised. Report Revised for Gov't Tax (Air Ticket=>Sales). GST Note for Sales & Return Added in Nature of Supply. Sales Place of Supply Based on Account Master (State). Goods Purchase (Multi Item) Added Purchase. Account Statement Report Revised for Purchase Return. Gross Profit Report Revised for GST Amount. Reimbursement Note Working Revised for Other Service. Markup Report (Report=>User Design=>Sales Vs Sales Return) Revised. GST 3B Added in GST Return. GST Register New Report Added. Calculate Tax On % Column Added in Goodes & Service Tax Master. Hire Register (Vendor) (Close Duty) New Report Added (Report=>User Design). HRS & KMS Per Index Problem in Rent A Cab Voucher. JN Column Rename to K3 in Airline Sales & Return. Print K3? Options Added in Service Master. Supplier Chrg. Column Added in Misc. Service Sales & Return. Purchase & Return Against? (Selection Working Revised for multi Selection). "UTGST" Column Added in GST Return. "F.strAccountName" Error in FIT Voucher Purchase Solved. Print Tax %? Working Done for GST. Airline & CSR PNR Column Added in Sales & Return View. Railway PNR Column Added in Sales & Return View. Vendor Column Added in Purchase (Against?). UTGST Added in Nature of Supply. Reimbursement Note Added in Master=>Setup=>Service. Tax Summary for Invoice & Credit Note Options Added in Master=>Setup=>Service. Extra HRS Calculation Revised for 24 HRS. Tax Summary Added in Rent A Cab Sales & Return. Service & Goods Master Working Revised. Excursion Voucher Wrong Detail Header Change. Total Extra Hrs. Printing Problem in Rent A Cab Invoice Solved. Account Voucher Printing Revised for GST. Want With Narration? Option Added in Account Statement Report. GST Note (Sales), GST Note (Sales Return) Options Added in Master=>Setup=>Service. Invoice Heading, Credit Note Heading Options Added in Master=>Setup=>Service. Taxable Value Added in Printing for Reverse Charge. Rant A Cab Invoice Revised for Outstation. Change Application Font & Size (Master=>Setup=>Options ). Application Default Font Size Increased. Same Courier Charges for Sales && Purchase Added In (Master=>Setup=>Options). Validation Column Added in Nature of Supply. Reference Column Added In Contact. Vendor Column Added in Rent A Cab. Export to Tally Working Revised. Outstanding Report Revised for Pending, Balance Amount. Visa Invoice & Credit Note Printing Revised for Net Amount. Reverse Charges Column Changed to Reverse Charges for Purchase In Account Master. Reverse Charges for Sales New Column Added In Account Master. Save Bank Reconciliation Date Same As Voucher Date Button Added. Set Last Voucher Prefix (Voucher Prefix Not Found In Master). Inclusive Tax Working Revised for GST. Nature of Supply & Place of Supply Enable In Sales Return. Transaction Date Validation Removed from Sales & Purchase Return. Ticket No. Issue in Ledger Updation Solved. GST Taxation Valation Issue in Sales & Return. Refundable GST Tax Issue Solved. Nature of Supply Added for GST Working. Applied from Date Added in Nature of Supply. Hide Void Rent A Cab Reservation, Duty, Close The Duty. Does it affect Gross Profit? Selection Save Working Revised. Ticket No. Locking Based on Type Removed. Is this union territories? Added in State Master. State Short Name Added in State Master. With Opening (Yes/No)? Options Added in Outstanding Report. Set Fonts in Voucher, Register Options Added in (Master=>Setup=>Options). GST Return Report Added in UDF=>GST Return. GST Return Excel New Module Added in Report=>GST Return. Purchase No. & Date Added in Purchase Return Module. Sales Invoice No. & Date Added in Sales Return Module. Entry, Message & Login Log Working Revised. UDF=>Account=>Sales/Purchase/Return (Supplier Wise) New Report Added. Cash Receipt & Payment Limit Actived. Tax On Advance Added in Payment Printing. Print & Preview function Revised for Edit Mode. To Time Added in Ticket Print. Ledger Amount "<> 0" Options Added in Account Ledger. GST Update in Data Migrate. Tax On Advance Added in Receipt Printing. GST Working Added In All Reports. GST Working Added In All Voucher Printing. Gov't Tax on Advance Feature Added in Receipt. Auto Set Credit Card Amount in Purchase & Return. Account Opening Reference Problem in Voucher Printing Solved. Cenvat Credit? Options Added in Account Master. Account Analysis for Opening New Module Added. New "Goods & Service Tax" Master Added. New "Value Added Tax" Master Added. Nature of Supply ID Added in Account Master. PAN Required Above for Cash Payment & Receipt Added in (Master=>Setup=>Options). Account Alloted To New Options Added in Account Master. Account Alloted To Options Added in (Ageing Analysis,All Outstanding). New Reason for Credit Note & Debit Note Master Added (Master=>Setup=>Options=>Taxation). New Narration Master Added (Master=>Auxiliary). GST Related Changed Done In Company | Branch | Account Master. New Nature of Supply Master Added (Master=>Setup=>Options=>Taxation). Service Tax Master Name Changed to Taxation. Type of Tax Option Added in Taxation Master. New Goods Master Added for GST (Master=>Setup=>Goods). Identifier if Goods or Services Option Added in Service & Goods Master. HSN or SAC Option Added in Service & Goods Master. VMPD/RA No. Added in Billing Discrepancy (BSP). Statement => Account Report Revised. Against Reference No. & Date Display Problem Solved. Against (New Reference) Enabled in Voucher for Against Reference. State Code Added in State Master. Voucher Tracking Options Added Account Voucher (Bank, Cash). Income, Expenses And Voucher Prefix Working Revised for Null. Pre-Design Report Demo Label Removed. Pull PNR from CRS File Creation Date Issue Solved. MIR file Airline PNR Problem Solved. Account Analysis (Register) Report Revised for Un-Defined. Account Info Working Revised for Pull PNR | Pick Voucher. Account Help Added for Analysis Code In Account Master. Account (Group Summary) New Report Added (Report=>User Design). Sales Vs Sales Return (Register (All Column) New Report Added (Report=>User Design). Purchase Vs Purchase Return (Register (All Column) New Report Added (Report=>User Design). Creation Date Column Added in CRS PNR Help List. Data Migrate Working Revised for Date Wise Voucher Number. Report => Air Ticket => Purchase Time Out Problem Solved. Selected Reference Amount Total Problem in Account Voucher Solved. Discount - Refundable Amount, Commission - Refundable Amount Added in Account Setup. Reference of (Agent) Column added in Hotel, Transport & Excursion Voucher. Sales Return & Purchase Return Added in Dashboard Monthly Chart. Export To Tally Working Revised (Parent Group). Analysis, Vehicle & Employee Detail Delete Working Revised for Sales & Return. Analysis, Vehicle & Employee Detail Against in Voucher Problem Solved. Passenger Name Added in Voucher Reference Grid. Customized Tour (Margin Register) New Report Added (Report=>User Design). Get Data from Contact Master for Traveller (List). Get Data from Contact Master for Tour Booking. Vehicle No. & Journey Added in Cab Voucher View. Notes Column Added in Air Tickets Setup Master. Data Locking Working Revised (Deletion Problem Solved). Excel Integration for Return Done. Default Basic Selection for Commission, Discount & Incentive. Purchase & Return Is Mandatory New Feature Added in (Master=>Setup=>Options). Tour End Date Problem In Dashboard & Report Solved. Narration Help Added In Transaction. Group (Under) Column Added in Gross Profit (Summary). Pull PNR Detail from Galileo MIR Working Revised for JN, G1+F2 Tax. Tour Booking Detail Added In Sales & Purchase. Sector From & To Width Increased (18) for Bus Ticket Sales & Return. Second Service Tax Working Revised in Credit Note. Don't Change Service Tax While Modify Record. Sales Refundable Tax New Report Added in UDF. Used In Column Added In Tour Booking. Airline (Tax IV) Caption New Feature Added in (Master=>Setup=>Options). Pull PNR Detail from CRS Working Revised for G1+F2 Tax. Pull PNR Detail from CRS Working Revised for JN Tax. Advance for Tour Booking Working Revised for JV. Account Analysis Detail Register Added In UDF. Analysis | Vehicle | Employee Detail Working Revised. New Report Sales/Purchase/Return (Monthly Pivot) Added In UDF. Account Credit Limit Working Revised. JN & WO Tax Added in Airline Sales & Return. Access Read Lock Working Revised. Delivered? Options Added In Account Voucher. Calculate TDS by Us On New Field Added In Sales & Return. Delete Analysis Detail on Voucher Deletion. Travelling (Air) Sector Detail Problem Solved. Infozeal Support Button Added in About Us. Required Fields New Feature Added in (Master=>Setup=>Options). Pull PNR from Excel Working Revised for single Purchase. Duplicate Cheque Number Working Revised. Tour (Checkin Register) New Report Added (Report=>User Design). Set Auto RawDataMode for XlsExportOptions. 0 Amount Allowed in Bank Payment & Receipt for Canceled Cheque. Cash Payment & Receipt Transaction Limit Added in (Master=>Setup=>Options). Air Ticket Default Setup Problem for Customer Discount Solved. "Account Handle By" Problem in Outstanding Summary Report Solved. Print Detail Tax (Airline)? Option Added in (Master=>Setup=>Options). Print Detail Tax (Misc)? Option Added in (Master=>Setup=>Options). Entry for (0 : Against Reference) | (1 : New Reference) | (2 : On Account) Filter Added in Account Voucher. Cheque Print Options Added in (Master=>Setup). NR:5 In Value Problem in Billing Discrepancy (BSP). Print Net Amount Option Added in Air Ticket Voucher. Billing Discrepancy (BSP) Working Started. Only Debit | Credit Option Added in Ledger Report. Only Receipt | Payment Option Added in Bank & Cash Book Report. Landscape Problem in Voucher Printing Solved. Set Credit Limit (Temporary) Option Added In Account Master. Walking Customer Wise Outstanding New Feature Added. Mail Sending Options Working Done (Master=>Setup=>Options). Calculate TDS by Us On New Field Added In Purchase & Return. TDS by Us Column Added In Account Setup. Press F4 for Get Last Notes & Narration. File Attachment Locked if Problem in Server Location. Get Data from Contact Master for Visa Booking. CRS PNR File Move to INVPNR Folder (Problem Solved). Sending e-mail based on Email User Name Working Revised. * In Value Problem in Billing Discrepancy (BSP). ReIssue Ticket Problem Solved for IUR. Incentive for Customer Added in Sales & Return. Duplicate PNR Message for Ticketing. Validate Pax Detail from Detail Section Added in Return. Incentive Added in Sales & Return. Ticket No. Heading Changed in Invoice & Credit Note. Sending e-mail based on Email User Name. Billing Discrepancy (Supplier) Working Started. New Purchase Vs Purchase Return (Detail) Report Added In (Report=>User Design). TTP for Amadeus AIR file Removed. Walking Name Added in Account Reference. Purchase & Return Reference No. Added in Sales & Return. Report Header Send Via HTML Problem Solved. Voucher Used In Column Added Hotel | Transport | Excursion. Nill Service Tax Print in Voucher Problem Solved. Reference No. Added In Tour Reminder. Import Data (Account Opening Problem Solved). Filter On Reference Date for Against (Reference). Inclusive Tax Options Added for Sales & Return (Master=>Setup=>Options). e-mail Sending Options Added (Master=>Setup=>Options). Miscellaneous Invoice & Credit Caption Changed. Import Master Data New Function Added. Tourist Category Added in Tour Quotation & Booking. Account Info. Alert Added in Credit Note & Account Voucher. MIR File Fare Problem for Child Solved. Account Info. Alert Added in Credit Note/Account Voucher. MIR Fare Problem for Child Solved. "Red" Mark on Sunday in Date Control. Service Provider Added in Tour Booking Voucher. From To Date Problem Solved In Rent A Cab Invoice Printing (Multi Duty). Service Provider Added in Tour Booking. Report Header Setting Working Done. Bank/Cash Book Register Selection Locked in Report. Report Header Setting Option Added In (Master=>Setup=>Options). Duplicate Ticket No. Problem While Branch Wise Working (Solved). RM Detail Working Revised for Supplier Account. Branch Issue in Billing Discrepancy (BSP) Solved. Default Terms & Condition Working for Tour Quotation & Booking. Application Configuration file working revised. Gross Profit (Detail) New Report Added in Management. Rent A Cab Printing Revised. Tour Booking Voucher Printing Revised. Account Searching On ID Column in Report (New Feature Added). Voucher (Single Print) Working Revised. Create Account from Tour (Error Solved). Account Searching On ID Column? (Master=>Setup=>Options). Create Duplicate Voucher Working Revised. Tour Booking Status Error in Booking Solved. Data Migrate Module Working Revised. Service Issue in CRM. Problem to Change Status Solved. Train No. Added in Account Master. Auto Train No. from master in Rail Requisition, Sales & Retrun. Ticket Prefix Removed from Bus & Railway. Analysis ID Added In Transaction. Ticket No. for Rail & Bus Length Increased. Option Added in Tour Booking (The Booking has been Canceled?). Ticket No. for Rail & Bus Working Revised. Want Alert for Account Credit Limit & Remraks in Sales? (Master=>Setup=>Options). View Tour Schedule Help in Package Tab. Lead Tracking Added in All CRM & Tour module. Extra Hrs Rate Print in Rent A Cab Invoice Solved. Backup & Restore on client computer working revised. RM Detail working done in ticket sales. Two More Hotel Season Date Added in Hotel Master. Print Rate? Set Default in Option Module for Voucher Rate. Minus Markup Allowed in Sales & Return. Vehicle Average Voucher Printing Added. Settlement Amount Option Added in Voucher Reference Frame. 0 Amount Allowed in Account Voucher. Walking Name Print in Account Voucher. Reference No. Added in Tour Booking. Tour Booking Module Checklist Working Revised. 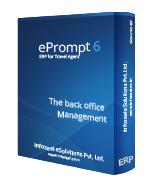 Tour Booking & Quotation Module Revised. Date Not Decided Option Added In Tour (Booking & Quotation) Module. Order Option Added In Tour Option Master. Rent A Cab Invoice print revised. E-Ticket print added in (Air Ticket) print. Multi tariff invoice print added for (Rent A Cab). Character casing options added in option module. Ticketing detail added in sector detail (Sales & Return). Ticketing tax print option added in option module. Auto pick flight number prefix. Nationality working revised in visa booking. Refresh working revised in bank reconciliation. Purchase & Return voucher printing added. Double click on view for edit (change/modify) selected record. Double click on invoice number for view detail in sales return. New Module RM Detail for air ticket. Narration for package in ledger problem solved. New Module Airlines Master for forex. New Report Added in (User Design=>Account=>Profit & Loss monthly). Commit working added (Software backend working). Single quote (') error in combobox solved. Other charges label in misc. service voucher printing. Account Setup working revised. Required to run ledger updation. Error in Outstanding report on submit click solved. "AutoFitToPagesWidth" for grid view Print & Preview. Fonts of report changed (Tahoma=>Cambria). Outstanding statement detail (With passenger detail) new report Added. Account (Is Deactivated | Is Black Listed) function revised. Ledger deletion function revised for commite tran. Notes (clients remarks) new module added in transaction. Credit limit status report added in (User Design=>Account). Account ledger report revised for zero opening. Rent A Cab outstation multi duty calculation revised. Rent A Cab voucher printing revised. Bank reconciliation validation working revised in bank entry. Segment count added in (Air Ticket => Sales). Report based on travel date option added in (Air Ticket => Sales). Total traveller column added in lead view. Reference no. column added in sales/return view. Dashboard for CRM summary working done. Account voucher number based on date option added (Master=>Setup=>Voucher Prefix). CRM grid view working revised for load data speedly. Dashboard for CRM working started. Refundable Tax new report added in (User Design=>Purchase Vs Purchase Return). New feature forex accounting working started (pending). Add new lead from follow-up. Passenger name list filling faster. Web integration revised for duplicate lead. Passenger name list added in requisition, vias booking, invoice & credit note. Against reference in view (rail requisition|all cab voucher) problem if one to many reference cleared (solved). TDS by us working revised for outstanding report & reference. Scheduler added in web integration. Voucher tracking added in account master. Maintain balance billwise working revised for data migrate. Searching on ID for account help (Ctrl+I). While Escape JIT Debug Error in report solved. "Voucher Print" Save in all working revised. "Account Credit Limit" Locking added in sales. Against column added in purchase & return view. Rent A Cab Voucher detail added sales & return notes. Tour notes added in invoice if tour schedule not found. The remote server returned an error: (500) Internal Server (solved). Print Itinerary? option added in tour quotation & booking. Print Overview? option added in tour quotation & booking. Maintenance (Shrink Database) function revised. Windows style base on user selection. Purchase problem in create duplicate voucher (solved). Sales filter by passenger/ticket no./pnr added in sales return. Sub group working revised in report. Both/Debit/Credit/All option added in trial balance report. Visa status and date added in visa booking module. Narration in purchase & return working revised. Branch data locking in report module & trial balance module. Lock following groups (for Non Admin User). Voucher charges new features added in purchase & return. "Hotel Voucher Markup" Auto purchase problem solved. "Account Envelop" Printing added in report. "SQL Server Version" Added in application config file. "Print Rate ?" Option added transport & excursion voucher. "Want BCC on User e-mail?" Option added in e-mail setting module. "Voucher Prefix" Length validation removed. "Contact No. & ID" Problem in account master help (Solved). Contra bank reconciliation date problem in migrate data module (Solved). Import ticketing data from excel (New feature). "Billing Discrepancy (BSP)" Revised for Rounded Off. Problem in Log Deletion Solved. "Fill Account Help" Revised for Increase Speed. "Account Setup" for Miscellaneous Services. "Other Account A/c" Added In Vehicle Fuel Average. "Other Account A/c" Added In Rent A Cab Sales. "Lead Reference" Added In Lead Follow-Up. "Without Opening Balance" Option Added in Account Ledger. Service Tax % & Detail Revised in Voucher Printing. "Company Data Splitting" Working Started. "Voucher Type" Added in Voucher Printing. "Account Reference" New Module Added in Account Master. "Purchase Vs Purchase Return (Summary)" Report Added In UDF Report. "Sales/Purchase/Return (Monthly Summary)" Report Added In UDF Report. Maintain Balance Bill Wise? Working Revised In All Voucher. "On Account" Voucher Reference Added In Outstanding Report. (Balance Sheet) & (Profit & Loss) Report Revised. Vehicle Detail Added in Voucher. Employee Detail Added in Voucher. Dashboard Monthly "Sales", "Purchase" Chart Revised. "Detail Statement? ", "Schedule Only?" Options Added in (Balance Sheet) & (Profit & Loss) Report. Send e-mail Module Revised for (553: Server Response). "Bank Book" (As Per Bank) Option Added in Report. "Favorite" Option Added in User Design Report View form. "Tour" Print Revised for Tour Options. "Status" Column Added in Lead View. "Status,Response,To Do" Column Added in Lead FollowUp View. email User Name Added in User Master. Web Integration Work for "Account", "Sales". New "3" Tour Report Added in UDF Report. Problem in Lead Packag/Hotel Detail Solved. UDF Report of Tour Revised. Want Lock Bank Account? Option Added in Master=>Setup=>Options. Create Duplicate Schedule Option Revised. Tour Schedule Problem in Tour Booking Solved. "Reference Clearance" Added in Utility=>Reference Clearance. Tour From & To Date Added in Print. Tour Schedule Selection Enabled for all. Month Problem in CRM Solved. Option Added in "Gross Profit (Transaction)" Report ("Service Wise", "Account Wise", "Handle By Wise", "Booked By Wise", "Employee Loyalty Wise"). Account (Day Book) New Report Added in UDF. Account Setup Master Revised (Column Added Date,Branch). Lead PassonTo Problem in Tour Module (Solved). lp Problem if Multi Branch in Report (Solved). Error (Column 'dtTourBookingCustomerRemindOn' does not belong to table Table.) Solved. Edit Permission Validation Removed from Zooming. Reminder for Customer Added in Tour Booking. Reminder for Customer Added in Dashboard. Tour Booking Zooming from Dashboard. Service Tax Based on Master? Option Added in Master=>Setup=>Options. Purchase Auto Narration Removed if Purchase Edited From Zooming Solved. "." Problem in Export to Tally 9 Solved. Three New Tour Report Added in UDF. Connection Timeout Increased Upto 120ms. Hide Rate Title if don't Show Rate. Transaction Zooming Problem if Multi Branch Record Solved. Next Follow-up Problem in Lead Follow-up Grid View Solved. Tour Terms and Condition Caption Added in Master=>Setup=>Option. Customer Wise/Airline Wise Gross Report Added in User Design. Problem in User Team Configuration if Multi Branch. Problem in UDF Report if Multi Branch. International Air Ticket Problem in Voucher (Single Print) Solved. Tour City Date Problem Solved. Blank Lead Detail Blocked to Save in Database. Problem in Lead Deletion if Multipal Lead FollowUp. Lead Management Passon to Working Revised. Discount Problem in Tour Invoice Solved. Basic/Tax/Discount/Markup Working Revised in All Tour Modules. Pick Tour Detail For Voucher Revised. Tour From & To Date Validation. Change Contact Name Problem in Print Problem Solved. Appled from Date Added in Excursion Master. Travel Date Added in Tour Vehicle. On Date Added in Tour Excursion. New Module Transport Added in Master=>Tour=>. Service Added in Tour Invoice for Purchase only. Send e-Mail (Display Mobile Number) Problem in Rent A Cab Voucher Solved. Service Tax Problem if Multi Branch Solved. Tab Problem in Create Account Fram in CRM Solved. Weekend Problem in Hotel Tariff Solved. Hotel Ragister Based on CheckIn Date. Loged User Probmel in Web Integration Solved. Tour Checklist Rights added in User Master. Driver Detail Added in Tour Check List. Transport Class Width Increased in Tour Module. Transport No. Width Increased in Tour Module. Service Tax on Markup Problem in Tour Module Solved. Voucher Reference Added in Tour Booking. Team Configuration New Module Added. Changes in Tour Date from. Option Added in e-mail Setting. 1. Transport Layer Security (TLS). 2. Port in e-mail Setting. Split Company Data Option Added in Utility=>Gateway=>Split Company Data. Create Account & Contact From CRM New Option Added. Page Break Removed from Tour Printing. Blank Space Problem in Html e-Mail Solved. Markup Option Added In Hotel Voucher. Two New Report Added in (User Design). Google Drive Sync Process Revised. Dashboard Rights Added in User Master. Google Drive Sync Path for Backup Added in (Master=>Setup=>Options). Problem in Hotel Rate if Season Date is Less then Current Date (Solved). Vehicle Average Reference Added in Outstanding. All Report Object Added for Report Permission. Click to Call API Added. Want to insert dayplan (Option Added in Tour Module). No. of Vehicle Added in Tour Module. Day Charges Added in Tour Module. Group & Report Summary Added in All User Design Report. Cleared Reference Selection Revised in Purchase Against. Cleared Reference Selection Revised in (P) Return Against. Gross Profit (Transaction) Report Revised. Season Date Order by Added in Hotel Master. Lac to Lakh Number To Words. Service Tax Register And Summary Report Revised (Calculated On Total Added). Summary (No. of Passenger) Option Added In Daily Sales (Air). New Report Parked Credit Note Added in (User Design=>Sales Return=>Register (Parked)). Export to Tally Option Revised. Create Duplicate Permission Button Added in Permission Master. Hotel Tariff Print Date Range Problem Solved. Cleared Reference Selection Added in Purchase Against. Cleared Reference Selection Added in (P) Return Against. Export to Tally Timeout Problem Solved. Remove Lock Button Added in Entry Error Module. New Report Air Ticket => Sales => Summary (No. of Ticket). Loyalty Report Added in User Design Report. Credit Card Report Added in User Design Report. Trial Balance (Zooming) Closing Balance Problem Solved. Statement of Sales Report Revised. Airline Name Added in Air Ticket Voucher (Full Page). New Report Added (Register & Summary). SET NOCOUNT ON (Function Added in Stored Procedure). Date Range Problem in Voucher Print Solved. Nill Account Balance Problem in Balance Sheet Solved. Nill Account Balance Problem in Profit & Loss Solved. Calculate Night Halt from Option Added in Vehicle Tariff Master. Sales Statement (New Report Added in Statement). Vehicle Minute Setting for Vendor (Master=>Rent A Cab=>Minute Setting). Air Tickets Action Added for Calculation Live/Report (Master=>Setup=>Air Tickets). Checking for update function revised. Driver Contact Number Problem in Send Message. (Problem, Solved). Account Wise Service Tax Option Added in Service Tax Master for Rent A Cab Only. All Voucher Printing Revised. (Problem, Slow Voucher Preview Solved). Service Tax Notification Added in Service Tax Master for Rent A Cab. Is Attached Vendor? Option Added in Vendor Master. Show Sales/Return Reference if Purchase/Return Reference is NULL in Voucher. Credit Note Against Invoice (Auto Adjust)? Option Added in (Payment Request & Outstanding Statemen). Rent A Cab Invoice Revised for Service Tax. Order by on Starting Date Issue in Cab Voucher Printing Solved. Different Customer Can't Allowed in Credit Note. (Allowed for Admin Only.). NumberToWords function Revised. (Problem, Slow Voucher Preview Solved). Individual View Created for Sales/Return. IsAccountLocked Added in Transaction Delete Process. Detail Register (Rent A Cab) Report Added (User Design=>Sales=>) Revised. Vehicle Average Show Data in Grid Problem Solved. CRM=>Booking Show Data in Grid Problem Solved. Auto Register Licence Detail (Software Licence Code Revised). Web Download Locked in Node Computer. Daily Purchase Report Added (Report=>Management=>). Hire Register (Vendor) Report Added (User Design=>Duty Slip=>). Detail Register (Rent A Cab) Report Added (User Design=>Sales=>). Rent A Cab Invoice Printing Revised for (Extra Hrs@, Kms@). tblAccountMaster.strAccountDoNotCalTax Width Increased to max. Voucher Narration Process for Ledger Revised. "Service Tax Amount","Swachh Bharat Cess","Krishi Kalyan Cess" Label Added in Invoice and Credit Note. Service Tax Report Revised for "Swachh Bharat Cess","Krishi Kalyan Cess". Service Tax Calculation Method Added. (Master=>Setup=>Options). TDS Calculated on in Voucher Validation Removed. Minute Setting Problem in Rent A Cab Tariff Calculation Solved. Sales Vs Sales Return With Markup Column. (User Design)=>Sales Vs Sales Return. Walking Column Added in Sales And Return Grid View. Order by Problem in Voucher Reference Grid (Solved). Customer ID Added in Master=>Company Master. Error ("'ePrompt_6_Cloud.App_Code.LoadingGrid.clsviewtblPurchaseGrid.intSalesHeadYear' does not exist.") in Purchase Solved. Error ("'ePrompt_6_Cloud.App_Code.LoadingGrid.clsviewtblPurchaseReturnGrid.intSalesReturnHeadYear' does not exist.") in Purchase Return Solved. Account (Deactived+Black Listed) Working Done. Web Portal Reference ID Added Sales/Return/Voucher. Unique Key Added in Option Master. Krishi Kalyan Cess Updation Done. Create Duplicate Service Tax (for Master). Reference Click Added in (Sales, Return, Daily Sales Register). Ledger Updation Under Process (Locking). Database Updation Under Process (Locking). Wrong Travel on Date in Report Problem Solved. Store Procedure (Web Login) Changed for Client Desk. Error in Ledger Updation Module Solved. Branch Name Added in Branch Master. All Report Revised for Branch Name. Image MemoryStream (A Generic error occured in GDI+) Problem Solved. Violation of intCompanyID UNIQUE KEY in Branch Master Solved. Wrong Duplicate Message in Service Tax Master if Multipal Branch. Wrong Duplicate Message in Hotel Master if Multipal Branch. Branch Added in All Report. All Type of Invoice & Credit Note in Single Print (Report=>Printing=>Voucher). Auto Close Database Off while Backup & Restore. Billing Discrepancy (BSP) Working Revised. Basic Amount Label Added in Rent A Cab Invoice. Filter String Problem (Against Reference Grid) in Voucher Solved. Export Account Detail In Other Company. (New feature Added in Account). Suppress Duplicates Passenger Name Problem in Printing Solved. Set Next Cheque Number (New Feature Added in Bank Payment). General Credit/Debit Note (TDS Entry Revised). Give Blank Report if No Data Found. Auto ZoomToPageWidth While Show Print. Days for Ageing Analysis Added in Option Master. Delete Locked in Sales Return Solved. All Sector Detail Posted In Ledger (Ticketing). New 3 Report Added in Report. Wrong Cancellation Amount in Sales Return Register (Problem solved). Add New Service for Miscellaneous (from Service Master). TDS eReturn New Report Added in Report (User Design)=>Account. Sales Summary New Report Added. View Link Button Added in Cheque Deposit Reminder. Starting Date Order Problem in Cab Voucher. (Problem solved). 'Bank OD A/c' Group Flag 'B' Updated for Bank Entry. IDispose Added in DBAccess And DataTable. New 12 Report Added in Report (Register). (1). Sales (Register | Summary | Detail). (2). Sales Return (Register | Summary | Detail). (3). Purchase (Register | Summary). (4). Purchase Return (Register | Summary). Voucher Tracking Module Revised for Purchase and Return. Outstanding Summary Order by Account Name. Cost Per Passenger in Tour. Problem if Multi Currency in Hotel. (Problem solved). Sales Register New Report Added. Abacus IUR Code Revised for Currency. Kilometer Reconciliation (New Report Added). Run Update in all Database (All Company). Popup Menu User Rights. (Problem solved). New Module Added for Voucher Tracking. (Record Right Click). Dashboard Reminder for Travelling and Rent A Cab Revised. New 7 Report Added in Report (User Design). (3). Sales Return (Detail Register). (4). Sales Vs Sales Return (Detail Register). Cheque Deposite Reminder Added in Dashboard. Bank Slip Printing. (New Report Added). Trial Balance Report And Module Revised. Trial Balance Revised (Balance Column Removed). Send mail in Print Priview Changed from (PDF file to MHT file). Trial Balance Detail (New Report Added). Day Book (New Report Added). Bank Account Allow Null in Bank Receipt. Supplier Commission Problem in BDR. (Problem solved). Send Cab Detail To Customer & Vendor (Click on Action Button). (-) Minus Issue in Profit & Loss. (Problem solved). Check no. of connected user button added in Update & Ledger Update module. Hotel Rate Problem if Markup Added in Invoice. (Problem solved). Reservation Chart & Duty Chart (New Report Added). Gross Profit (Transaction) Report Revised (Removed Service Tax And TDS Amount). Feature Added in Trial Balance (Want Closing Amount <> 0?). Violation of UNIQUE KEY constraint (error message). Problem solved. Account mandatory validation removed for infozel user. Connection timeout value increased to 120. Two More Sector Added in Air Ticket Sector Detail. Discount And TAC Calculation Revised (for A+B). SQl Connection Close Problem Solved. XPO Session Dispose Problem Solved. Discount And TAC on Selection Problem Solved. Wait Screen Added in Transaction Add/Edit/Save. New module added for check error in entry (Utility=>Error=>Entry). Invoice Reference Added in Purchase Narration. Credit Note Reference Added in Purchase Return Narration. Check Duplicate Purchase Number in Sales. Check Duplicate Purchase Return Number in Sales Return. Rent A Cab Voucher Vendor Tariff Last Service Tax added. Rent A Cab Invoice Get Vendor Tariff Data. Rent A Cab Credit Note Revised. Against? in Purchase And Return Save Locking if Against Used by User. Against? in Purchase And Return Save Locking if Against Linked in Entry. Passeneger X 3 Narration Problem Solved for Ticketing. Hotel Rate|Discount %|Discount Added in Hotel Invoice. BDR for BSP Rights Problem Solved. Voucher detail added in purchase if purchase from voucher. Enable customer id in sales if credit note done (only for Admin). Voucher detail for purchase added in ledger updation. Supplier TDS & Refundable Service Tax Amount problem solved. PNR length increased 6 to 10. Coach no. length increased 6 to 10. Notes added in all voucher. Hotel tax based on voucher rate. Close reader method added for ("Timeout expired. The timeout period elapsed prior to obtaining a connection from the pool. This may have occurred because all pooled connections were in use and max pool size was reached."). Export to excel from grid data. Date problem solved. Traveller error ("Violation of UNIQUE KEY constraint 'CK_tblTravellerHead_intTravellerNumber'") solved. Entry for continue in Air Ticket. Stock Problme Solved. Import data from ePrompt opening balance problem solved. Against Purchase and return for voucher problem solved. Km(s) Column added in transport voucher. Voucher number (0) (Problem solved). Duplicate voucher number (99999999) (Problem solved). Lock save if save in process. Wrong label in transport voucher (Child Policy) solved. Get last supplier for voucher in purchase. Urea added for vehicle Fuel average. Error "Index out of reng" Solved In Import Module. Voucher purchase against invoice reference (Problem solved). Discount added in Hotel invoice detail. Service tax on markup in cancellation (Problem solved). Error (Trial Balance) Module Revised. Airline Ticket Setup Charges Added In Pull PNR. Error "[dbo]. [PARTYMAST]" Solved In Import Module. New module added for Query Runner (Utility=>Gateway=>Query Runner). New module added for check trial balance error (Utility=>Error=>Trial Balance). Data Backup on node(client) computer. Meal charge calculation problem in tour cost Solved. Html maile Revised for images. Hotel Tariff problem in tour cost Solved. Data merge new module added (Utility=>Gateway=>Data Merge). Air Tickets (setup) new module added (Master=>Setup=>Air Tickets). Room category problem in tour confirmation solved. Net Rate problem in tour problem solved (Child nb). Infozeal support added in contact. Send e-Mail authentication problem solved. Send e-Mail (HTML) image problem solved. Advance filter added in all module. Contact number added in user master. Send e-Mail for service confirmation from the tour. Lead reference added in all invoices. Logo added in eMail Signature. Include & Exclude added in tour schedule. Number to words function revised. Account filter added in all voucher printing. Calculation problem in service tax on supplier commission solved. Problem in hotel meal charges calculation in tour solved. Rent A Cab Client Desk (New feature). Account address printing problem in voucher solved. Company address printing problem in voucher solved. Problem in restore module solved. In tour module default cost per service. Remind on (Day) column added in Reminder Master. Send e-mail(smtp) feature added in report preview. Auto complete e-mail Added in Send email form. All report rights filed removed from user master. Update software from www.infozeal.co.in. (New feature added). Currency added in tour Quotation|Booking. Markup column added in tour net rate. Meal plan added in hotel voucher printing. Cost problem in tour quotation & booking solved.